Connecting with the customer through the online channel and expanding their experience to build loyalty. 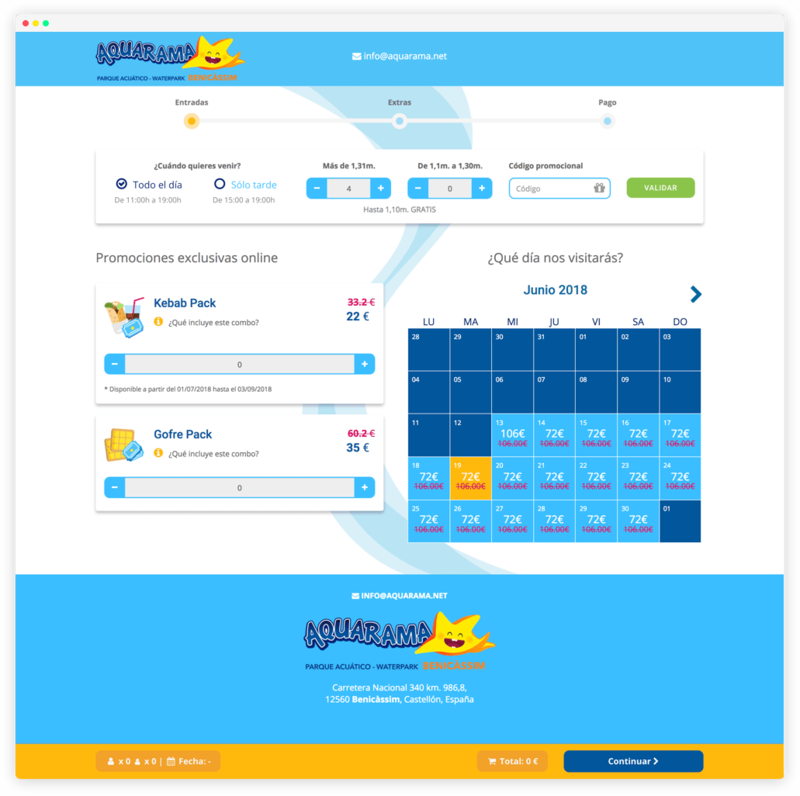 Aquarama has quadrupled the sale of tickets by web and app with an integral digital strategy aimed at results. Benicàssim waterpark (Spain), a Mediterranean holiday landmark. Aimed at families and holiday goers, but also at young people and adults who are looking for strong emotions. 1. 360º digital turnaround to increase online sales. 4. Reducing the strength of intermediaries by controlling promotions and/or online sales. 5. Greater visibility on the internet. 6. Avoiding long waits at the entrance. 1. Digital strategy Digital transformation at all levels. 2. Account model revenue share (to success). 3. Moving from traditional box office sales to promoting online sales. 4. Enhancing the visibility of the online channel. 5. Opening advance sale with calendar. 7. Aligning offline and online strategy. The system lets you choose the date of entry to the park and possibility of change taking into account the capacity. The days are marked in green, orange and red depending on the availability. 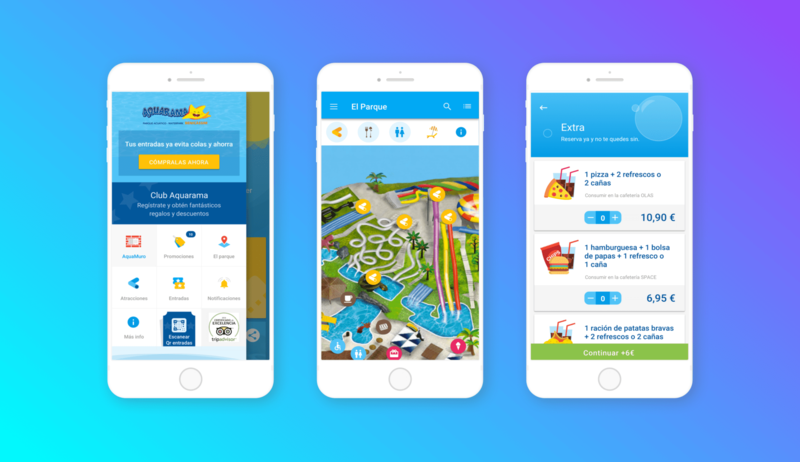 The administrator makes it possible to control the capacity of the park in real time, playing with different types of tickets. Payment and access to the park with PaynoPain gateway to improve control and speed up the entrance at peak attendance. EasyGOband wristbands with NFC system for internal use. Better usability and SEO configuration to prioritize online sales on home page. Connection to the Web with the park’s ERP for sales control. All types of tickets are validated on the web. Chat Live to offer direct assistance to the user. Blog with service information and quality articles, advice, and news, empathizing and building loyalty with the user. Facebook Ads to promote certain messages, animated GIFs with dips. Conceptualization, development, launching and management of the official park application. Wall with all the updated information about the park. 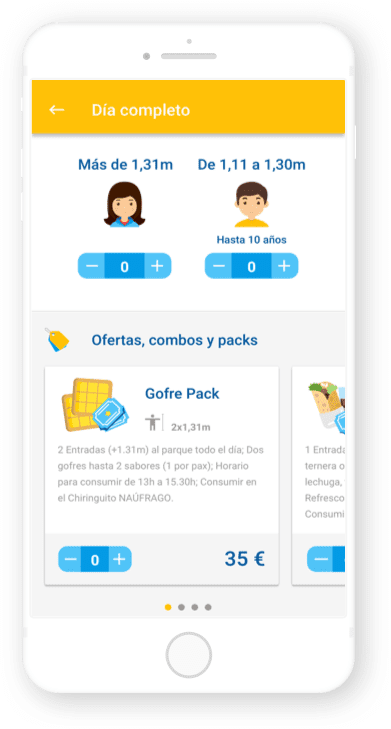 Loyalty program with discounts and gifts for interactions on the app: buying tickets, sharing content. 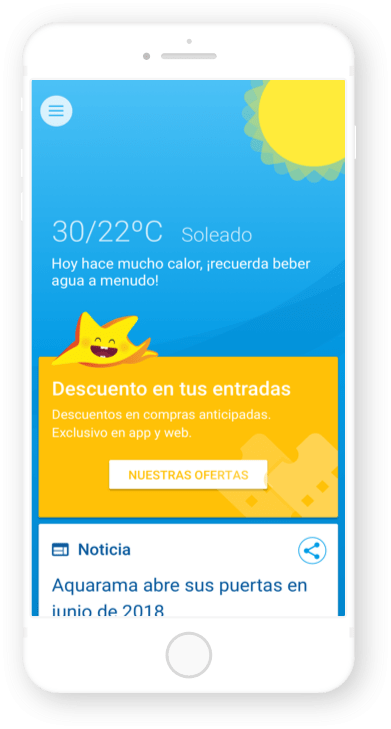 Buy tickets with dynamic prices based on the day of purchase, the capacity and its history, the weather forecast and the number and type of tickets. The system allows you to choose date of entry to the park and possibility of change. Possibility of exchanging tickets promoted by third parties. Improvement of online reputation. It breaks the dependence on ticket promotion by third parties. It solves problem of queues and unforeseen full capacity. Higher attendance figures are achieved and saturation peaks are avoided. The chat reduces phone calls made to customer service and provides information about users. id nec pulvinar neque. amet, tristique id at Curabitur Praesent mi, leo.